May 26, 2011 by Cathy A. How perfect that she is needing to make a little gender neutral quilt for her baby?? Yay! Congratulations, Ashley, I’ll be sending you an email to get your mailing address. Feel free to share pictures of what you make and I’ll post them on Facebook and/or the blog! In my sleepy state, I don’t think I let you know the other post that I do have lots of Charm Packs of the Lily & Will II collection along with a few prints from that fabulous collection in my shop. I do have lots of giveaways that need to be done soon, too. 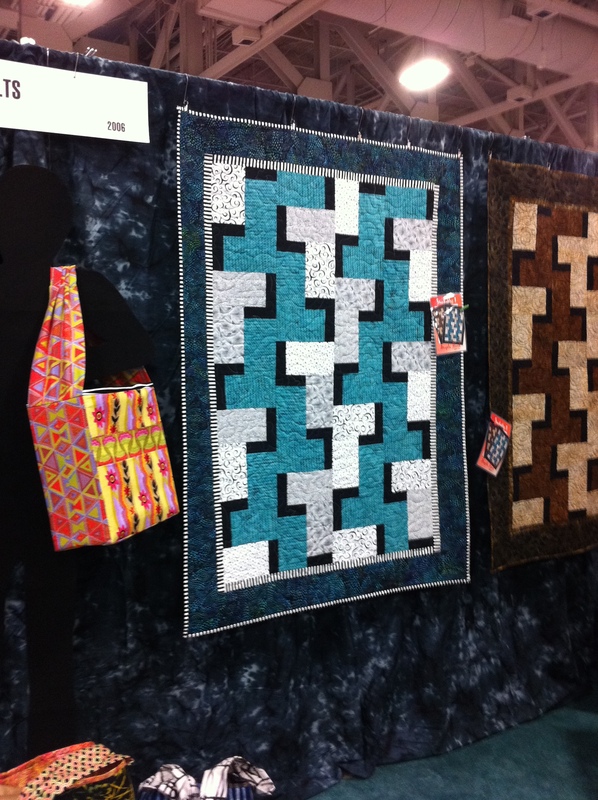 I did get a few things at Quilt Market to share with you. I don’t have a ton like some bloggers seem to have. Partly because I passed a few things up because I didn’t want to carry them around all day on the show floor. Or because they were too bulky to carry–like a sample bag of quilt batting that I passed up on two times because it was too bulky! Can you believe I passed up free stuff? And just to give you a preview of some of my favorite things from Quilt Market, here’s a picture of one of the many, many new patterns I picked up for the shop. 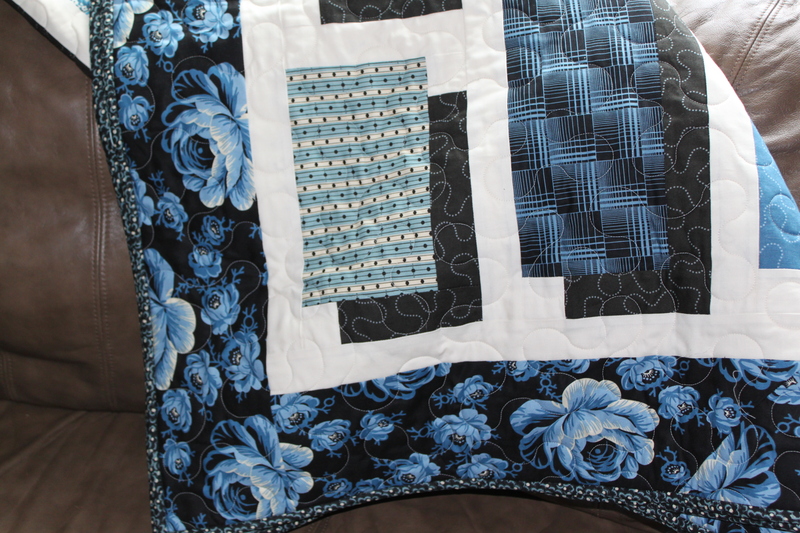 It’s called Stackables 1 by Maple Island Quilts. Isn’t it fun?? I have the pattern for that great big bag hanging next to it, too! May 22, 2011 by Cathy A.
It’s giveaway day, but I’ve got a hurt back. So my post is going to be short and sweet. 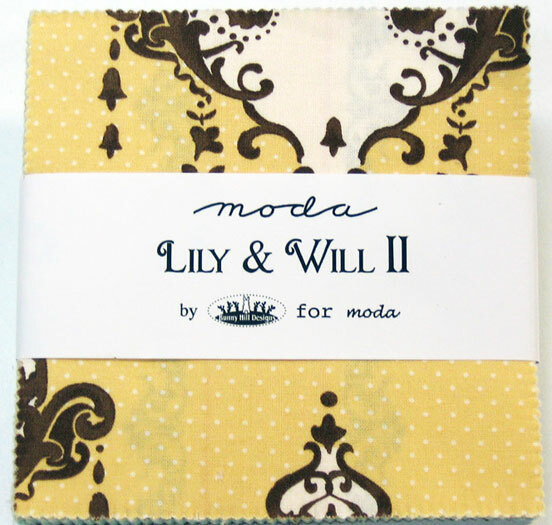 I’ve got a charm pack of Lily & Will II and 2 yards of coordinating fabric. 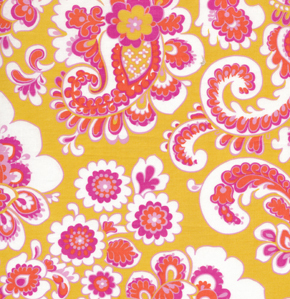 The coordinating fabrics will be one yard of Bunny Hill Blue Moda Bella Solids and then a choice of a yellow and brown print or aqua and cream print. It’s enough to make up a little baby quilt top & probably the backing, too. I think this fabric line is adorable, and I love that it’s gender neutral! To enter, simply tell me what you would do if you were certain you wouldn’t fail. For me, the answer is that I would open an actual brick & mortar fabric and yarn shop with a wonderful coffee shop attached. There would be a wonderful space for classes and casual sewing and knitting for customers. It would be everyone’s favorite crafty hangout! Check back for more giveaways in the upcoming weeks. I’m slowly sorting out what I have for giveaways from Quilt Market last week, so there will be more to giveaway! Sorry, but this is only open to US residents. Please accept my apologies that I didn’t extend this to international entries. Giveaway will be open through May 25th. Comments are closed and a winner will be announced in the next post. Thanks! April 10, 2011 by Cathy A. The quilt is going to my friend’s mom. He told her about the quilt a few days ago, and she is really excited to get it! He doesn’t send her many gifts because there is never really anything she needs or wants. So this seemed like a great thing for her. When I met her last summer, I brought her some peonies from my garden. As it turned out, that’s her favorite flower. So when I was trying to figure out something to do with this beautiful fabric with peonies, I realized a quilt for Jeannie would be perfect. March 17, 2011 by Cathy A.
Honey Child could well be this sweet face…Or, Honey Child could be the the fabric that the sweet-faced boy is holding. 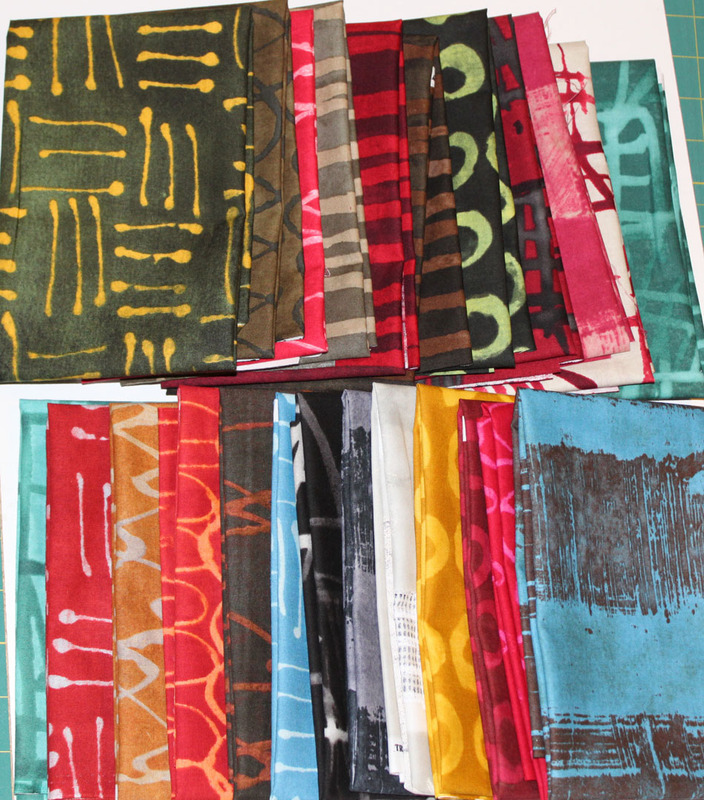 Honey Child is a new line of fabrics by Jennifer Paganelli of Sis Boom for FreeSpirit Fabrics. I’m quite in love with the beautiful, bright colors. 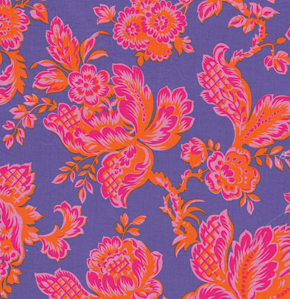 The dark periwinkle blue is wonderful, and I always love orange and pink together. There is an aqua colorway as well, however, I don’t have that in my shop. I do have all the prints in the pinks and orange and periwinkle blues though. And they’re wonderful!! I love the name Honey Child for the fabric, and calling someone “child” reminds me of this song “O-o-h Child” from the Five Stairsteps in the year 1970. A good and uplifting song, don’t ya think? February 15, 2011 by Cathy A.
I really enjoy reading all the comments, and I also enjoy checking out all the blogs that are linked in people’s info. 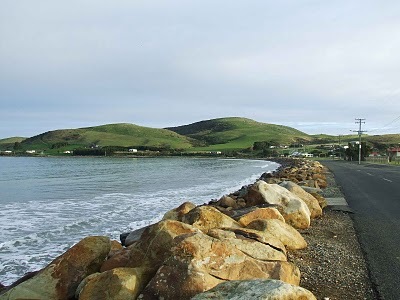 I saw some amazing pictures of someone’s trip to the New Zealand coast and lots and lots of great quilts, of course. I’m surprised that most people said they do a little something for Valentine’s Day. Jewelry stores would have us all believe that jewelry is a requirement for Valentine’s Day. I had expected more people to say they don’t do anything at all. I do like to hear that many people think we don’t need a special occasion to show a bit of extra love. One commenter has a tradition of making homemade heart-shaped pizza. Thaw was my tradition for several years, and I’m not sure how it got dropped by the wayside. Maybe I’ll revive it next year! The winner is Nancy who said that she sends Valentines to her friends, which I thought was pretty nice. I’ll be contacting Nancy and sending the Sherbet Pips Charm Pack to her. Susan Brubaker Knapp shared a wonderful quote yesterday on her blog, and it’s one of my favorites. She has a great blog, by the way! February 13, 2011 by Cathy A. 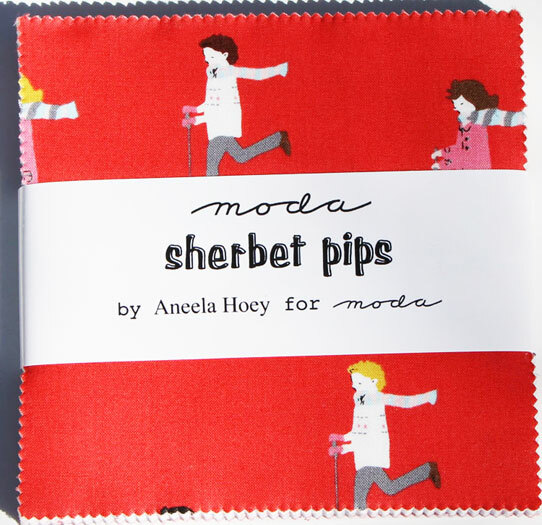 Just a quick little giveaway for Valentines Day…A Charm Pack from Sherbet Pips by Aneely Hooey for Moda Fabrics. Do you “celebrate” Valentines Day? Let me know in the comments, and you will be entered to win. One entry per person. I will close comments to entries on Monday night (late Pacific Standard Time, Feb 14th) and pick a random winner to be announced on Tuesday, February 15th, 2011. 2/15/11–Comments are now closed and a winner will be announced on a new posted. January 29, 2011 by Cathy A. Yes, I’m a single girl (I use the word “girl” loosely), and I’m quilting. But more specifically, I’m joining the Single Girl Quilt Along! The Single Girl Quilt is a wonderful quilt pattern by Denyse Schmidt that I’ve loved for a long time. And when I saw that Nova from A Cuppa and A Catch Up, Katy from I’m A Ginger Monkey and Megan from Lucy & Norman are doing a quilt along, I figured this was my best chance of ever getting this quilt made. I think I will need the hand-holding and motivation that a quilt along provides.There’s a flickr group, and they’ve asked that you only join if you are serious about finishing the quilt. So I joined, and I’m serious about finishing the quilt! First, I had to pick out fabrics. 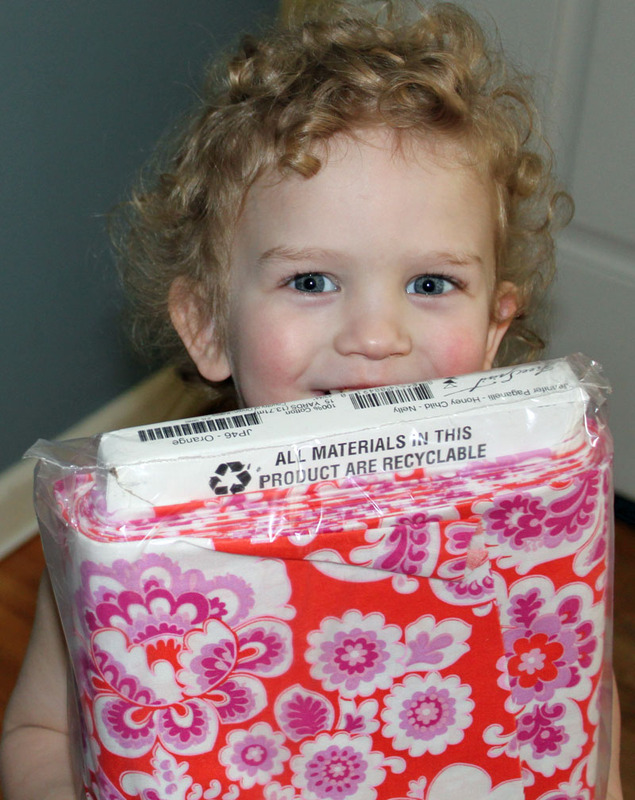 I thought perhaps Innocent Crush mixed with my favorite Good Folks fabrics, all from Anna Maria Horner. But I have a Good Folks quilt that is about 1/4 finished from last year, and I want to finish that one someday. Then I thought perhaps something with aquas, greens and blues because I love those colors–and I had seen a fat quarter bundle of some Denyse Schmidt Hope Valley fabrics that would be perfect to build from –but it was sold out by the time I went back. On Wednesday night, I was cutting an order for a lovely customer and it included all 31 fabrics from the wonderful Marcia Derse third in line fabric collection. 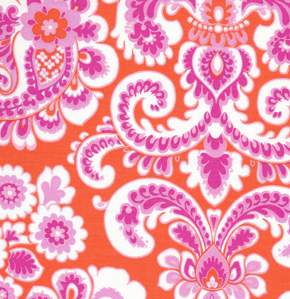 And it hit me–this was the fabric for my quilt! I don’t know why I didn’t think of it sooner. I did end up ordering a little more fabric, though because I’m not sure I want to use the near solids (Modern Textures) fabrics for the rings on the quilt. Which meant I needed a few more fabrics. So I ordered some from a previous Marcia Derse collection–and I’m assuming they will work perfectly. I am still not sure what I’m going to use for the background fabric yet. But I’m really excited to be starting a quilt with these fabrics!! 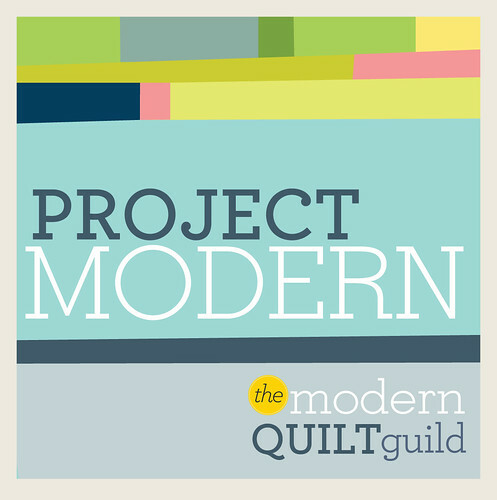 I was at the Seattle Modern Quilt Guild’s sew-in last night and got started on cutting out templates…It’s fun already! Is anyone else joining in the Single Girl Quilt Along? Anyone? Anyone? Come on–it’ll be fun!